The Alice In Chains & Friends Fantasy Football League has launched its fifth annual charity auction. The Seattle band have partnered with Music For Relief to auction one-of-a-kind items and memorabilia to raise funds for the victims of Typhoon Haiyan in the Philippines. Proceeds from the auction will help Music For Relief deliver critical medicine, emergency medical services, water, sanitation and disease prevention efforts to the 12 million people impacted by the storm. The 17 day-long auction includes collectible items donated by league participants and friends, such as original paintings by Alice In Chains' Jerry Cantrell; a trip for two to NYC to attend the Porsche Design Fall/Winter 2014 Runway Show at New York Fashion Week with Chester Bennington of Linkin Park; a custom Gibson Les Paul guitar signed by Green Day's Billie Joe Armstrong; a Fender acoustic guitar and acoustic bass autographed by Mike Inez and more. 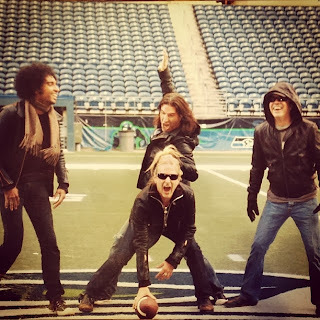 Alice In Chains' world tour in support of their latest album, “The Devil Put Dinosaurs Here”, continues next month when the band plays Australia’s Soundwave Festival.